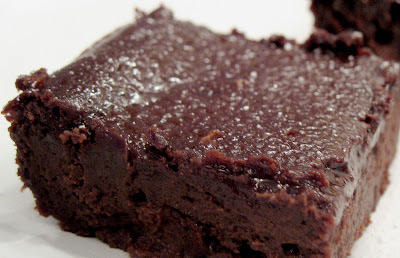 What’s great is these brownies a protein packed and make a very healthy snack. And I don’t feel bad eating one (or two) of these for breakfast or early morning treat if the chocolate craving so desires to strike. 1.) Preheat oven to 350 degrees F. Puree the black beans in a food processor or blender until completely smooth (may need to add a couple Tablespoons of water to help this along, but you don’t want the beans to get soupy). 2.) Mix all ingredients together in a large bowl until just combined. Grease 9×9 inch glass pan with about 1 teaspoon of coconut oil. Pour batter evenly in pan and bake for 40-50 minutes, watching that the edges don’t burn. Cool for at least 1 hour, or they may be too gooey to slice. ENJOY! You can stir in any of your favorite additions. We love unsweetened coconut flakes and dark chocolate chips! Other ideas: chopped almonds, chopped macadamia nuts, swirl in almond butter, chopped walnuts, 2 Tablespoons espresso, or almond extract. Hi Elise, thank you SO MUCH for addressing the chococlate brownie addiction. Can’t wait to try these, but one question – when you list the ingredient, Coconut oil, liquid – does that mean an actual liquid coconut oil (which I’ve never seen) or does it mean liquefy your coconut oil? Many thanks. Hi Julie! I just mean to liquefy it, you’re exactly right. Heat it on the stove, or in the summer if your house gets warm enough, sometimes it will liquefy right in the jar. ;) Hope you like the brownies! Always happy to help and provide inspiration! Yummy brownies…my fam loved them!! One question…how about a recipe for frosting for the bronwnies??? Hi Aleshia — glad you guys are loving the brownies! I have about 4 different frosting options (Advanced Plan!) in my Season’s Eatings holiday e-book. You can download it from the e-Book Menu Planners page at the top of the homepage. Any of the frostings would be great on these brownies, but my favorite is the Coconut Icing (doesn’t taste like coconut tho, no worries). Enjoy! Hi Elise, I have organic brown rice flour on hand. Do you think I could substitute it for the almond flour? Or use organic wheat flour? Or how about coconut flour? I cannot find almond flour at any health food stores in my area. Thank you so much for your comments. You can try substituting with the other flours and it should turn out okay texture wise (however the ratio of coconut flour to almond flour is 1:2). Keep in mind that brown rice flour and wheat flour are sugar (they turn to sugar quickly in your body) and create disease-causing inflammation. These flours are not advised for use even on the Core Plan. To easily make your own almond flour at home, simple grind whole raw almonds in your blender or food processor until it forms a fine meal. You’ll find this will save you lots of money in the long run, too! Happy baking! Hi Elise! I made these last night, and they are delicious. But, mine turned out very cake-like….not moist and fudgy. I followed your recipe exactly. Is this how they are supposed to be? Hi Elise, I finally made the brownies and they are very good, and rich, and chocolatety. Next time, I will grind the almonds to a fine meal. (a little chewy). I am excited about the technique you use for making powdered xylitol. (under Strawberries-n-Cream Bundt Cake). I have a recipe for chocolate icing that I could substitute the powdered xylitol for powdered sugar. I think this would be delicious on the brownies. Thank you, Elise, for all your great recipes. Y E S, pulverized xylitol is my new favorite thing, too! :) I’ve got a great frosting recipe in my Season’s Eatings holiday e-book that explains how to make powdered xylitol (the substitute for powdered sugar). There are 4 total frosting recipes in the e-book. Sounds like you are an experienced baker. You might enjoy all the dessert recipes in the e-book! Keep up the great cooking! I’ve loved reading your comments tonight! I experimented making icing with pulverized xylitol (and arrowroot powder). I do not like to crunch on xylitol in the icing. No way I can pulverize the xylitol more. Maybe, I should have made Cream Cheese icing with xylitol. This should cut out the grittiness. Would this be better? Or should I use the powdered stevia instead? (the Stevita brand). Is the Spoonable kind good? Blend the butter or coconut oil with the stevia or xylitol. Add the coconut milk, if using. Note: I only used 1/2 TBSP. butter because I do not like the taste of so much butter in icing. Not sure why you’re getting crunchy xylitol? The xylitol should pulverize down into a fine powder very easily (if it’s birch xylitol), to the same fineness of powdered sugar. It should also dissolve and mix easily with the cream cheese or butter or coconut oil..whatever you are using. Try using a clean spice grinder for the task. This will give you the finest powder, vs using a food processor. I wouldn’t try making the frosting with stevia as the ratios will still be off and the frosting volume will be skewed. Even with the Spoonable Stevita stevia, it’s still not a 1:1 ratio to sugar. You’d have to mess around with conversions, but I’m sure it’s possible if you took the time. I can’t attest for your recipe above, but it’s looking like it just uses regular xylitol. Still not sure why the grittiness. It’s calling for enough liquids to dissolve the 1/4 cup xylitol.. Make sure you have a high quality brand of xylitol from birch trees. This is the main thought that comes to mind — that the one you’re using could be a lower quality, possibly with other ingredients in it causing the harsh texture? You usually cannot find birch xylitol at the store. You have to purchase online from organic sellers (I order in bulk to save $$). Xylitol sold in stores is from corn = bad for our bodies and still grain/sugar! Hope this helps, keep trying! You’ll find the perfect ratio for your taste buds, just takes some trial and error!! :) Keep up the great work! Using a spice grinder/coffee grinder is a great idea. The problem could be I used a corn xylitol (at least the package did comment it is not a GMO). Do you recommend Emerald Forest brand? It is the only company I have found online made from birch trees (not organic). e-book has some good icing recipes. Emerald Forest is a good brand as it’s non-GMO birch xylitol. You definitely want to stay away from the corn xylitol as corn is so mass produced that all corn in America is genetically modified when you go down to the cellular makeup of it. Problem is marketing people realized “non-GMO” is “in” so they stopped dumping on the chemicals and label it as non-GMO. But corn anything is still GMO. Does that make sense? If you get a chance to go to MaximizedLiving.com and listen to their most recent webinar — it was on GMO farming and the corn issue was covered. It would be a better explanation than I can give in this little window. Ok the ratio of Coconut flour to Almond is 1:2? Can you give me the amount I need of coconut flour for this recipe instead of almond? I must make these!! !Also can you tell me a way to only use the xylitol? I have a bag of it and only the lil packets of Stevia? I’ve not tried this recipe with coconut flour just because I suspect it’ll dry it out quite a bit and take away the gooey texture I was going for. But, give it a try if almond flour isn’t your cup of tea. So the 1:2 ratio means 1 part coconut flour to 2 parts almond flour (or 1/2). So cut the amount of almond flour in half to any recipe and that equals the equivalent amount of coconut flour to use based on the other ingredients. And just a reminder, this ratio is a generality. The resulting texture of any recipe also depends on what liquids you are using in the recipe. To convert from the brand of stevia I use to xylitol (or other stevias), I have included a conversion table in the front section of Season’s Eatings holiday e-book. For this recipe if you’re going to up the xylitol, I’d recommend pulverizing it into a powder first so it doesn’t leave your brownies with a gritty texture. Throw some xylitol thru a coffee grinder then sift it over the top like you would powdered sugar, looks amazing and adds a lil extra sweet for it! Another thing you can do, is melt down a chocolate bar… I use 100% dark, slowly melt it down with some coconut oil,and powdered xylitol, poke holes all over the pan of brownies after baked and pour the chocolate mixture over the top! k just tried these- they ended up dense and caky, and slightly salty? Next time I try again I think i’ll decrease the soda to a tsp or less, will it matter much? What can i add to make them more moist? One thing we do is add a bit more coconut oil when we make it, we don’t use leveled measurements for it. Really helps the moistness. Hi Elise, Can’t wait to try these brownies for the chocoholics in my family at Christmastime! Can I completely leave out the xylitol for those sensitive to it? Will it change the recipe or should I add something else in it’s place? Hi Jeri, Leaving the xylitol out should be okay — replace with 1/3 cup pureed Granny Smith apple (peeled) and about 10 extra drops of pure liquid stevia. May need to bake a little bit longer, too. I tried these and they came out raw after 55 mins what did i do wrong?? i did every thing that you said to do. PLEASE HELP!! this happend to me on the lemon garbanzo bean pound cake. Hi Soph, My first thought is to check your oven. Your thermostat might be broken. You can check that it is calibrated correctly by placing an oven-safe thermometer (like this one: http://tinyurl.com/oventhermometer) inside the oven, closing the door, and setting to 350 degrees. Wait until it says the oven has finished preheating, then check the temperature on the thermometer. If it is calibrated incorrectly, you’ll have to read your manual on how to adjust it, or have someone out to repair/replace a part. Second thought, are you in a high altitude area? Both of the recipes you said came out raw use beans as the base. Altitude could affect the bake time for these dense batters. Third thought, what type of pan are you baking in? Are you doubling up on bake pans — this insulates the batter and slows the cooking time. ← Product Review: Seventh Generation & GIVEAWAY! !